With the release of the new iPhone 6 and iPhone 6 Plus featuring bigger and thinner screen, Apple lovers and would-be buyers are all crazy now. But the new iPhone is not just bigger and thinner. It has the Retina display presenting brilliant colors and higher contrast, a new A8 chip delivering more power, iSight camera with new sensor, etc. To make the most of iPhone 6 or 6 Plus, you may try to sync local files like MKV, AVI, VOB, Tivo, FLV, and WMV videos to this HD smartphone. However, you’ll suddenly realize that iTunes doesn't support syncing these video files to iPhone 6 and iPhone 6 Plus, for the new released smartphone still follows the Apple tradition, which means only MOV, MP4, and M4V files are supported during the syncing job. Video files like MKV, AVI, VOB, Tivo, FLV, and WMV are not iPhone 6 friendly formats, and what you’ll need is a versatile iPhone 6/Plus video converter to transcode them to iPhone 6 or 6 Plus natively accecpted formats. Pavtube Video Converter Ultimate is a first class video converter for iPhone 6 and iPhoen 6 Plus to convert MKV, AVI, VOB, Tivo, FLV, and WMV as well as preserving the HD quality to match the Retina HD display of the new iPhone. 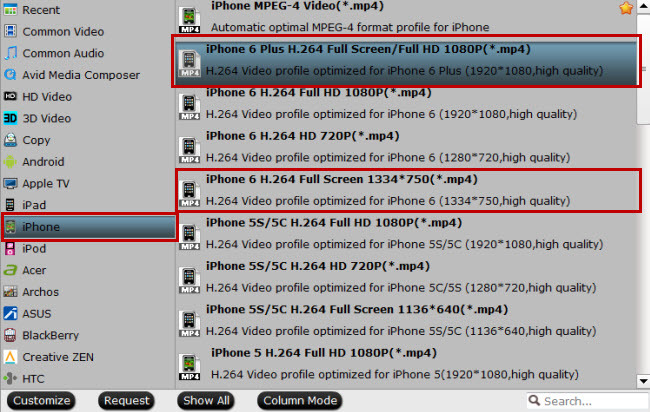 How to watch MKV/AVI/VOB/Tivo/FLV/WMV on iPhone 6/iPhone 6 Plus? 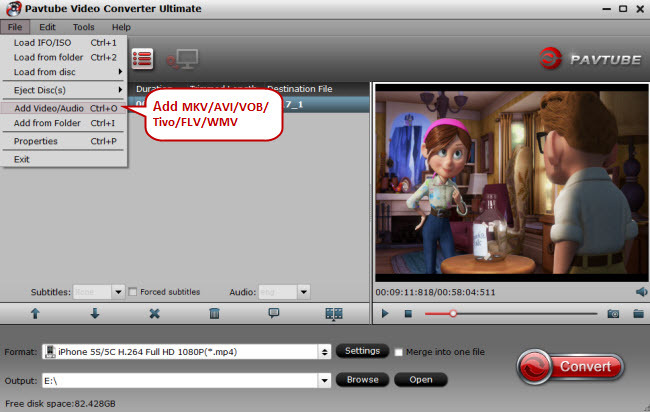 Run the iPhone 6 video converter on PC (get Mac iPhone 6 video converter), and click “File” ＞“Add Video/Audio” to add MKV, AVI, VOB, Tivo, FLV, and WMV videos. Click the format bar to follow "iPhone" ＞ "iPhone 6 H.264 Full Screen 1334*750 (*.mp4)" for iPhone 6 and "iPhone" ＞ "iPhone 6 Plus H.264 Full Screen/Full HD 1080p (*.mp4)" for iPhone 6 Plus. 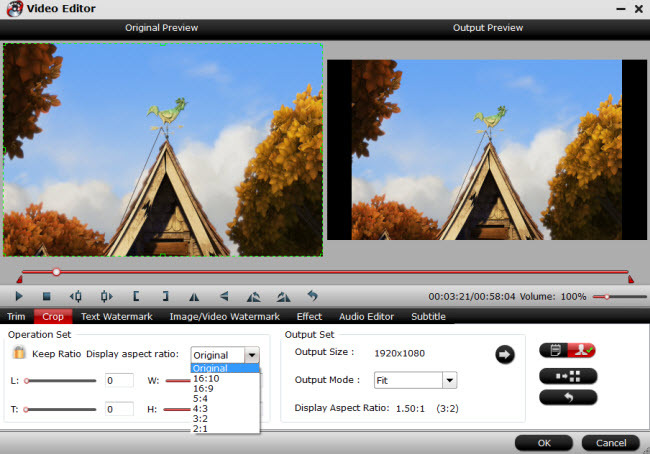 You can also transfer MKV, AVI, VOB, Tivo, FLV, and WMV to other formats (e.g. M4V, MOV) supported by iPhone 6 or iPhone 6 Plus according to your need. Interested in movie creation? Try the built-in video editor in this iPhone 6 video converter. Click “Edit” or the pencil icon and the “Video Editor” window pops out. You can save a video clip from the MKV, AVI, VOB, Tivo, FLV, or WMV file by using “Trim,” enjoy a video without black bars on iPhone 6 bigger screen with “Crop,” watermarks, special effects, and subtitles can also be added to the video file you want to convert for watching on iPhone 6 or 6 Plus. Go back to the iPhone 6 video converter on main UI and click on “Convert” button to start converting MKV, AVI, VOB, Tivo, FLV, and WMV to iPhone 6 and iPhone 6 Plus. Connect your iPhone 6 or iPhone 6 Plus with PC and sync the converted MKV, AVI, VOB, Tivo, FLV and WMV video files to iPhone 6 or iPhone 6 Plus with iTunes. Blu-ray and DVD can also be synced to iPhone 6 or iPhone 6 Plus with iTunes.